Skywalker Trampolines is a name to reckon with in the world of trampolines. This American company gains its popularity from its mix of high-quality and innovative construction designs, and a price tag that you never have to break the bank for. But the best part is that Skywalker brands tend to have something for everyone whether you are in need of the best trampoline for kids or an enormous rebounder for adults. Our article of the best Skywalker trampolines reviews brings 10 models that we highly believe that you won’t go wrong with this year. The Skywalker Trampolines 15-foot Jump N’ Dunk is the most popular model from this manufacturer. This is what you are likely to hear of most whenever the topic of the best Skywalker Trampolines 2019 comes up. As its title suggests, this trampoline has a basketball loop that allows the jumpers to jump and dunk a basketball thereby adding more to the fun. This trampoline’s 143 sq. ft. worth of jumping area coupled with its 200 lbs worth of maximum weight capacity makes it an ideal option for more than 1 jumper. On the same note, its 16 gauge steel legs and frames make it structurally stable and should, therefore, give the parents peace of mind as the kids ride on the bouncer. The Skywalker Trampolines 15-foot trampoline uses 96 6.5’’ long springs. This number of springs plus their length mean that this isn’t the bounciest Skywalker trampoline around. But it’s still notably bouncier compared to a model with 5-inch springs. The Skywalker 15 round trampoline is one of the most popular and top-rated tramps from this brand in the market today. This is a fully-featured trampoline that offers enough jumping space for a large family of jumpers. The manufacturer recommends it for ages 6 and above and it has a weight limit of 200 pounds that makes it possible to accommodate 2 (and even 3) average-weight kids jumping together or 1 adult. This affordable Skywalker trampoline is crafted with a heavy-duty gauge steel for the frames and legs and both have been powder-coated to resist rusting. The enclosure net, on the other hand, is made of polypropylene- a material that we highly advocate for thanks to its excellent flexibility. On the same note, we really appreciate that the net attaches directly to the jumping mat since it means that the spring system and the metallic frame are outside the jumping area. The Skywalker 14 foot trampoline square might be a good bet if you are looking for an affordable tramp that will fit in a tight yard where a 15ft round won’t. Square trampolines are highly favored compared to their round alternatives since they offer a larger jumping surface which is great for jumping with friends. They also tend to be notably bouncier although this also highly depends on the number of springs and their length. What makes this model one of the best Skywalker trampolines is its slightly higher weight limit. Most trampolines from this brand mostly offer weight capacities of around 200 pounds. Thus, the extra 50-pound allowance makes a huge difference for most adults. The Skywalker 14ft Square is fitted with 96, 6.5-inch steel springs. This number of springs is slightly lower for a trampoline this size and the springs are also notably shorter, in our opinion. This means that bounce is notably affected. A great way to improve the bounce is usually to cross the springs, but this affects their durability too. However, unless you are after the bounciest Skywalker trampoline, the 14ft Square should impress especially with its durability and safety construction designs. Our next recommendation below is pretty much similar to the model above only that this one is one foot smaller at 13’. It’s also notably pricier compared to the 14-foot square trampoline and that means that you should expect more especially in terms of structural quality and durability. The Skywalker 13’ Square Trampoline is made of heavy gauge steel that has been galvanized to resist early rust. True to this manufacturer’s tradition, this trampoline also uses specially designed t-sockets for each frame and enclosure joint to give the frame and enclosure system a uni-body design for structural stability. In addition, this model is fitted with 84 springs that boost the polypropylene jumping mat’s performance to give the jumpers a really good bounce. Actually, this is one of the best Skywalker trampolines for gymnastics. So, if you have upcoming gymnasts in the house, this tramp might be a good option. The Lily Pad would be our first recommendation if you are hunting for the best Skywalker trampoline for kids. This little tramp is meant for kids above 3 years and below 7 years and can support up to 100 pounds worth of weight. This relatively high weight limit means that the Lily Pad can accommodate up to 3 kids of between 3 and 5 years at once although there would be virtually no space to maneuver because it is meant to take one jumper at a time. Besides its child-friendly color designs, we also appreciate that the Lily Pad uses bungee cords as opposed to springs. Although this does sacrifice some bounce, it also means that there will be no cases of pinched fingers and feet. On the same note, parents appreciate that the bungee cord system is padded and that it’s actually outside the jumping area since the enclosure netting attaches directly to the jumping mat. Rectangular tramps make the bounciest trampolines in the market, and what we are looking at here is one of the most recommendable models from Skywalker. This trampoline has a length of 14’ and a width of 8’ and a weight limit of 200 pounds. These dimensions mean that this 14’ Skywalker trampoline has enough jumping surface for up to 2 kids jumping together (although this isn’t advisable) or one adult. This tramp uses 80 stainless steel springs but what’s so interesting about them is their 7-inch size which gives them a greater stretch leading to a relatively higher bounce. Oval trampolines are rare, but they are there and have a special place among those who love to jump on a trampoline. These trampolines are more or less a hybrid between round and rectangular-shaped tramps, and that’s to say that they offer the best of both worlds. This shape makes the best trampolines for family that is more into gymnastics. You might want to consider the Skywalker 17’ by 15’ oval if you want a large and bouncier trampoline that you intend to place in a slightly narrower but long yard where a rectangular tramp won’t fit. The Skywalker Oval trampoline has all the safety features that Skywalker tramps are known for including a gapless design, a polyethylene net, and padded spring system and enclosure poles. In addition, its oval shape and 200-lbs weight capacity make it even much safer for 2 jumpers since it tends to create 2 jumping zones at each side while preventing natural gravitation towards the center as it’s the case with round tramps. There are times when the largest trampolines aren’t always the best. 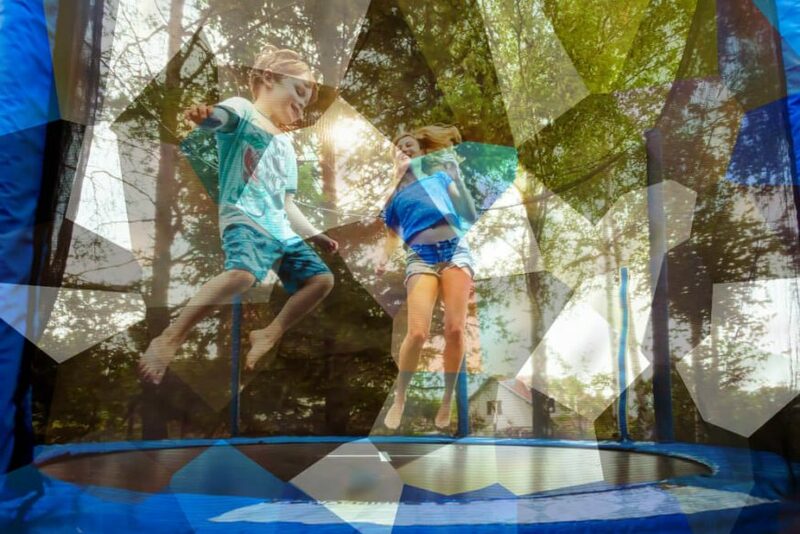 If you are looking for a trampoline that will accommodate several jumpers at once without grabbing real estates on your yard, the Skywalker 10ft round trampoline might interest you. This trampoline has been engineered using the same blueprint used for the 12ft, 14ft, and 15ft Skywalker trampolines only that it’s designed with space-saving in mind. It has 4 heavy gauge steel legs to support its 175-pound weight limit and 4 padded enclosure net posts that curve out to lower the risk of injuries even further. The Skywalker 10ft round trampoline is fitted with 64 5.5’’ tightly-coiled springs. While the length of these springs means a lower bounce, it makes this trampoline a great pick for small kids who are switching from an indoor to an ‘adults’ tramp. The 175-pound weight capacity, on the other hand, means that virtually everyone below the limit can comfortably ride on the tramp. Next in line is yet another oval trampoline that is slightly smaller than the model that we saw earlier but also amazingly cheaper for the small difference. We were really impressed by this tramp’s large jumping area. The fact that it does not pull the jumper towards the center means that it is a notch higher in terms of safety when 2 jumpers are jumping on it compared to a round tramp. Speaking of safety, this Skywalker Trampolines 16-foot oval trampoline is supported by 6 pairs of legs that have been w-shaped to keep the tramp put on the ground for stability. In addition, and as it’s the case with Skywalker trampolines, this model’s 96-spring system is outside the jumping area and has been covered with a pad for safety. In addition, the enclosure posts are padded and angled at the top to keep the net away from the posts for an additional level of safety. There’s yet another feature that makes this trampoline worth going for; a bonus double toss game that keeps the kids engaged as they wait for their turn to jump. Our last pick for the best Skywalker trampoline reviews is actually the most versatile in regard to making your kids’ childhood memories. This is a 12-foot trampoline with an enclosed netting that attaches directly to the jumping mat. The net is made of polyethylene and it’s supported by 6 posts with a cap at the top to prevent it from falling amidst jumps and angled to prevent the jumpers from hitting and injuring themselves on the poles. Similar to most Skywalker trampolines, the 12ft Jump, Dunk, and Kick has a weight limit of 200 pounds. It also has a good amount of bounce thanks to its 80 5.5-inch springs. But what makes it unique from the rest is its double basketball hoops inside and a kickback net that keeps other jumpers busy outside. Trampoline accidents and injuries are real, no wonder we always put the aspect of safety as the first consideration when guiding our readers on how to buy the best trampoline. In most instances, tramp-related accidents emanate from feet and hands being caught in the spring system and slamming on the steel frame. The good thing is that most Skywalker trampolines come with safety nets right off the bat. In addition, the netting enclosure attaches directly to the jumping mat which keeps the spring system and the frame outside the jumping surface for added safety. Trampoline safety does not stop at the enclosure system alone. You also want to ensure that the entire rig can withstand the weight of the jumper (or jumpers if you intend to have more than 1 person jumping together). Most Skywalker trampolines have weight capacities of around 200 pounds although there are several of them that accommodate up to 250 pounds. This weight limit is notably lower compared to other trampoline brands including Acon that offers infinite single-jumper weight limit. So, consider a model with a higher rate especially if your weight is within the 200-pound mark. Most trampoline parts especially the padding and springs require replacement after a few seasons. Thus, it really pays to ensure that you’ll be able to get replacement parts for the model that you are eyeing. Fortunately, there are Skywalker trampolines replacement parts for virtually all models both on the manufacturer’s site and on other e-stores. There are several accessories that add to the general fun, safety, and assembly of the trampoline such as a ladder, spring-pulling tools, and a rain cover for the mat. Unfortunately, most Skywalker trampolines don’t ship with these accessories. This isn’t a big issue though considering the low price tags that they come with. So, inquire beforehand about what is included in the package to determine whether you might want to add the accessories to the basket before placing your order. Jumping on a trampoline is one of the most recommendable ways of burning pent-up energy and relaxing muscles. It also has a lot of health, physical, and educational benefits for the kids. Skywalker Trampolines has a way of offering high-quality and safe tramps that don’t cost the earth. Whether you are in need of the largest bouncer in town or you are after an affordable indoor trampoline for kids, we believe that our collection of the best Skywalker trampoline reviews has the right model for your family’s needs.